A simple “one-pot” meal, this dish can easily be scaled up to feed a larger group. The flavors in this recipe are particularly complimentary—with the sweetness of the potatoes, sour brightness of the citrus, depth from the variety of spices, finished with the salty punch of the olives. Preheat oven to 350°F. To make the braising liquid, combine citrus juices, orange zest, chicken broth, and 1 tsp sea salt in a mixing bowl. Tie parsley and cilantro stems together with cooking twine to make a bouquet garni. Add to braising liquid. Next combine all spices in a separate, small bowl. To sear the chicken thighs, place a medium sauté pan or dutch oven (that has a lid) over high heat, add 1 Tbs ghee. Pat thighs completely dry with a paper towel, and salt with 1½ tsp salt. Place thighs in skillet skin side down. Sear until browned and skin naturally releases from pan, then flip and repeat on the opposite side. Remove chicken and set aside. Next, add leeks to cast iron pan with a pinch of salt. Sauté for a few minutes until translucent. Add spice mixture and continue to sauté for 1–2 minutes. 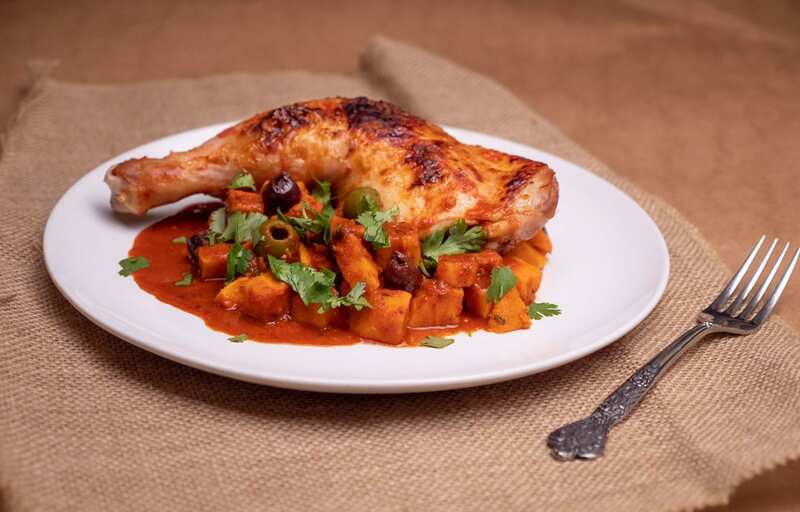 Add chicken, sweet potatoes, and olives. Slowly add the braising liquid until it covers the chicken thighs about half way. Cover and place in oven for about 20 minutes. Remove from oven and check to make sure chicken is cooked through. Then remove chicken and vegetables from pan using a slotted spoon, leaving liquid. Reduce liquid over low heat. Add remaining ghee and immediately whisk to emulsify. Season with salt, lime juice, and orange juice to taste. Remove bouquet garni and top with chopped herbs. Serve hot.